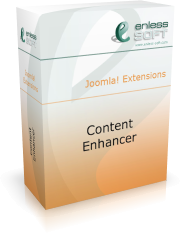 Content Enhancer allows definition of variables and provides a way of using those variables along different parts of the web site. Content variables are evaluated with each loading of a page, only if needed. Variables could be dynamic or static. Randomization of a variable value is also possible. Module enhancement is a feature that allows you to dramatically boost up functionality of any Joomla module. This is achieved by using a module wrapper and assigning dynamic values for module parameters. Randomizing parameter value is also possible. Automatic content replacements gives the administrator ability to create aliases for web content. An example would be to create an alias [my_link] which resolves to a link you frequently use. Then you use the alias in articles and it is automatically replaced with the real link. You could use any HTML as a value(replacement) with automatic replacements. It is also possible to use content variables in the definition of replacements. This way you can achieve greate reusability and flexibility in your web site. It is possible to define the source not only as exact text, but also as regular expression. Both content variables and automatic replacements could be organized in groups. This aids web site administrators by providing a way to organize items by some website-related logic. Additionally, default variable prefix could be defined in 'content variable' groups. This prefix will be automatically suggested when creating a variable in the group. Using the included Enhancer Module allows you to have HTML in the titles of modules. For example, you can set the module title to be a link to other page from your site. You can use any HTML as a title. This is not currently possible in Joomla.